Charlie Brooks, farms 14000 acres of hill and 200 acres of grassland (including silage, hay and barley) in Ross-shire. He has 90 AAx breeding cows to AA bulls and 800 breeding ewes – Blackface, Cheviot and increasing number of Suffolk x BF. “We were delighted with the scanning rate of the Blackface ewes sired by Essie Suffolks – 161% with only 2 yeld out of 100. This was by far the highest scanning rate of all breeds (cheviot, texel and Blackface). 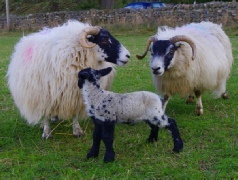 “The Blackface x Essie Suffolk lambs get up with vigour. We retained 30 Suffolk cross ewe lambs (and Blackface and Cheviot) for breeding. The Suffolk X females are good mothers. “All the remainder were sold store at Dingwall Auction Mart. Since we started using Essie rams the Suffolk lambs have produced the top prices due to the heavier carcass.